Stoney Creek Roasters (www.stoneycreekroasters.com) is located at 83 North Main Street in the town of Cedarville Ohio. They are a small local roaster in a small town. When we received this Yirgacheffe from them we were looking forward to trying it. It is both Organic and Fair Trade. You may think we are crazy but when we opened the bag the aroma reminded us of sweet mustard. We both like different kinds of mustard so we were pleasantly surprised. The beans looked like a medium-dark roast. We changed up our order of brewing this time so we went with the French Press first. When brewed the aroma is somewhat sweet and spicy, but not the mustard aroma we first smelled. The taste is complex; spicy and bright with a lingering bitter-sweetness. The flavor seems to hit the tip of the tongue and then spreads out over it. Kim thought it paired very well with lemon, cinnamon and almonds. Next we used the auto-drip and there is a nice dark color in the pot. The flavors were somewhat milder but they linger giving a nice aftertaste. The spiciness is there and we found ourselves talking about what we tasted and trying to figure out the flavor profile. Kim thought it was good with peanut butter, chocolate and fruit. Lastly we used the Chemex coffee maker for brewing. The taste is smooth and seems to fill the mouth. The taste is cleaner and we thought there was a touch of clove. The aftertaste lasted longer and was brighter. We both liked the complex taste of this coffee. It seemed to change somewhat with the different brewers. We found ourselves talking about this coffee long after our cups were empty. It is a very intriguing cup of coffee. We looked forward to each brewing method and tasting. We are looking forward to sharing it with friends. I think we liked it best in the French Press, but we would give it two thumbs up with any brewing method. 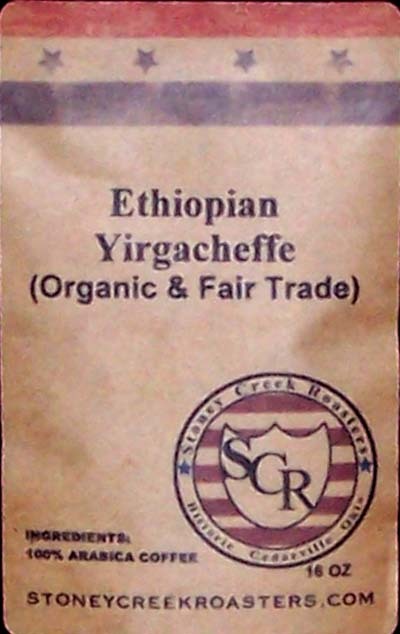 If you like Ethiopian Yirgacheffe coffee or want to try one, we encourage you to try this one from Stoney Creek Roasters; we think you will like it. You’ll also be supporting a local roaster trying to make a positive difference in the world. We received this coffee for free and offer objective feedback. Until next time remember to stop and enjoy the coffee and conversations.